Tritium (3H) and radiocarbon (14C) were used to determine the age, to delineate a flow regime, and to estimate flow velocity of medium-depth groundwater (50–200 m) from a Middle and Upper Pleistocene confined aquifer. Young groundwater age was determined using 3H and an exponential piston-flow model (EPM). Three correction models (Tamers, Pearson, and Fontes and Garnier) were chosen to date the 14C age of old groundwater. Groundwater ages of the medium-depth groundwater ranged from 3.5–25,790 a. Groundwater is relatively young in most of the piedmont area, although two high-age zones (with ages > 20,000 a) exist in the center of the plain. 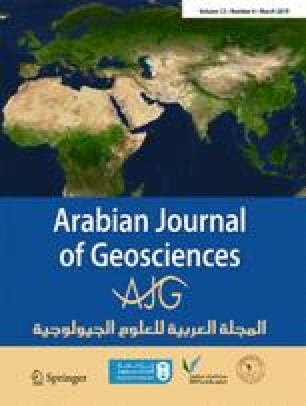 Groundwater age distribution characteristics indicated that groundwater flows from the mountain area to the basin area, and that the oldest groundwater in each high-age zone flows toward the depression cones. Two large local flow systems were formed because of overexploitation, and the regional flow system from north to south no longer exists. This study delineated the age of medium-depth groundwater in the entire Taiyuan Basin for the first time. The results can help promote the sustainable use of groundwater in the Taiyuan Basin. We thank Liwen Bianji, Edanz Editing China (www.liwenbianji.cn/ac), for editing the English text of a draft of this manuscript. This study was funded by the National Natural Science Foundation of China (No. 41502254) and the China Geological Survey project (No.12120114086401).